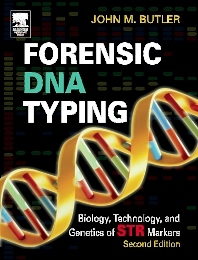 Forensic DNA Typing, Second Edition, is the only book available that specifically covers detailed information on mitochondrial DNA and the Y chromosome. It examines the science of current forensic DNA typing methods by focusing on the biology, technology, and genetic interpretation of short tandem repeat (STR) markers, which encompass the most common forensic DNA analysis methods used today. The book covers topics from introductory level right up to cutting edge research. High-profile cases are addressed throughout the text, near the sections dealing with the science or issues behind these cases. Ten new chapters have been added to accommodate the explosion of new information since the turn of the century. These additional chapters cover statistical genetic analysis of DNA data, an emerging field of interest to DNA research. Several chapters on statistical analysis of short tandem repeat (STR) typing data have been contributed by Dr. George Carmody, a well-respected professor in forensic genetics. Specific examples make the concepts of population genetics more understandable. This book will be of interest to researchers and practitioners in forensic DNA analysis, forensic scientists, population geneticists, military and private and public forensic laboratories (for identifying individuals through remains), and students of forensic science.